This isn't really a random picture, it's my old bicycle. I purchased this second-hand, back in June, because I needed a quick way to get around. It wasn't much of a bike though, but as the website for the bike shop said, "it takes a special kind of bicycle to be a $100 bicycle", so I knew what I was getting in to before I bought it (for the record, it cost $150, but that's not much better). In fact one of the workers at Cyclesmith (not where I bought it) who had to fix the tire on it once told me, "my girlfriend had this same bike and it was horrible twenty years ago, so I can't imagine it's much better now." Nevertheless, even though the seat post clamp wouldn't tighten properly, so I had to constantly pull it up at every red light, and the brakes didn't work at all during the rain, and the dérailleurs were constantly giving me issues, it was still my bike and I felt pretty close to it. It was also instrumental in helping me collect most of the pictures you've seen on this website up until now. However, a couple of weeks ago I was going to see a friend, and the front tire exploded, and so did the tube. At the same time, the chain slipped off the front and jammed itself up in between the chain rings. That was the third blown tire on the bike in that one week alone, and after being told by someone at Cyclesmith that it needed about $400 worth of work done on it, I thought it wasn't worth it and decided to buy a new bicycle. 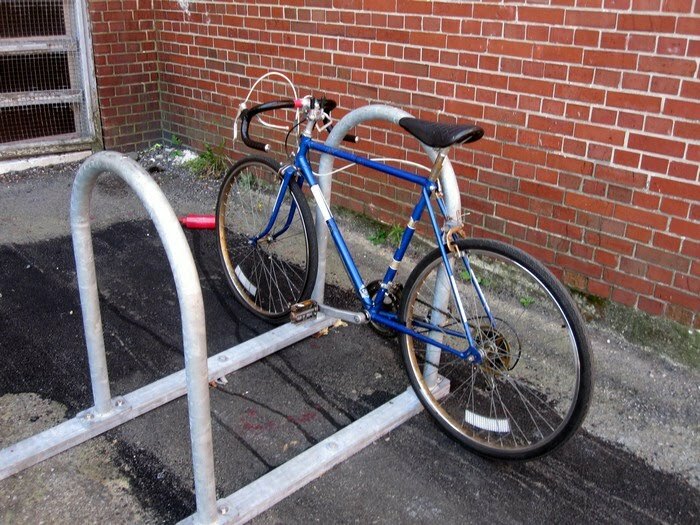 This picture is the last I ever saw of my bicycle after walking it over to donate to a North End community bike charity. I hope someone else has more success with it than I did. For the record, my new bike is awesome. I also bought a rack on the back, and rigged up a "unique" basket for it. I have fenders to keep my shirt from getting muddy in the rain, and lights and a bell. In short, it's the ultimate EP Cruiser. I'll show a picture soon.